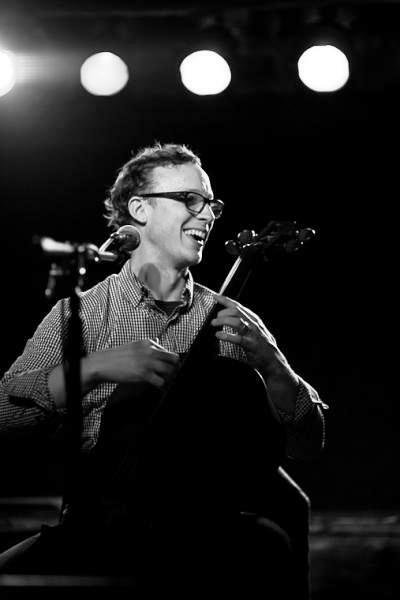 On September 25th, 2012, Ben Sollee will release his fourth studio album, titled Half-Made Man. Sollee is known for his innovative cello playing, which he skillfully uses to highlight his songs and grab your attention, and this album is no exception. Half-Made Man consists of ten well-balanced tracks, including the single “Unfinished.” The album’s tracks stand strongly alone, as individual pieces of music, and also operate cohesively when pieced together as an album. Methodical instrumentation is supplemented with thoughtful lyrics, touching on a wide variety of topics. As the album title suggests, Ben presents a thought-provoking idea in Half-Made Man: that he is a work in progress, which is a highly relatable and humbling concept for his listeners. Throughout the album, Ben conveys a harmonious paradox: we are somehow complete and whole in an unfinished state of being. We should strive to evolve and reflect, rather than focus on ourselves as a finished product. His music echoes this conflicting idea, as it manages to strike a balance between soothing and stimulating; raw and polished; spontaneous and thoughtful. It is ripe with vulnerability and delivers what the title promises. The album, which was produced by Sollee, is vibrantly packed with the sounds of his cello, guitar, and mandolin, as well as his silky vocals. Additional contributors include: Carl Broemel (My Morning Jacket) on electric, acoustic, and pedal steel guitar; Alana Rocklin on bass; Jordon Ellis on percussion; Jeremy Kittel on violin; and Abigail Washburn on guest vocals. The songs on Half-Made Man complement each other, without being repetitive. Ben’s voice is expressive with its warm, smoky tones, and he doesn’t hesitate to hold the sweet notes. He uses the varying pace of his voice to punctuate his heart-felt lyrics. The first three songs are soulful, bright attention-grabbers. Within the initial seconds of the first song (“Whole Lot to Give”), Ben uses his unorthodox cello playing to pull you in. The second song, “The Healer,” keeps you right with him, using unassuming percussion his signature, yet unexpected strings. The lyrics of “The Healer” touch on the common, although often misguided, desire of so many people to heal those around them. Ben picks up the pace with “DIY,” artfully playing his cello with a raw quality, delivering notes with a country feel. His down-home cello style is ironically steeped in sophisticated and controlled percussion and staccato-like vocals in the chorus. The end rocks out in a manner that would guarantee foot stomping in a live performance. In the fourth song, Ben slows it down, and allowing the listener to focus on his tender lyrics. He slows the pace in this song, but it serves as a platform for the following track, “Unfinished,” which is also the album’s single. Ben plays off the energy of “Unfinished” in the following song, “Get Off Your Knees.” He dials down the tempo, but maintains the energy with the notably bluesy style, more illustrative lyrics, and abundant pedal steel guitar. Ben continues with a slower pace in the reflective tracks “Slow Down” and “the Maestro.” He follows up with “Pursuit of Happiness,” which is my personal favorite from the album. Bluesy, soulful, and magnetic, the lyrics are rife with everyday human trials and tribulations. The album concludes itself with the sweet, earnest “Some Lovin’.” Overall, Ben Sollee’s fourth album, Half-Made Man, will certainly make his audience think and feel. Full of heart-swelling melodies and lyrics, and a compelling philosophical stance, Half-Made Man is not to be missed.